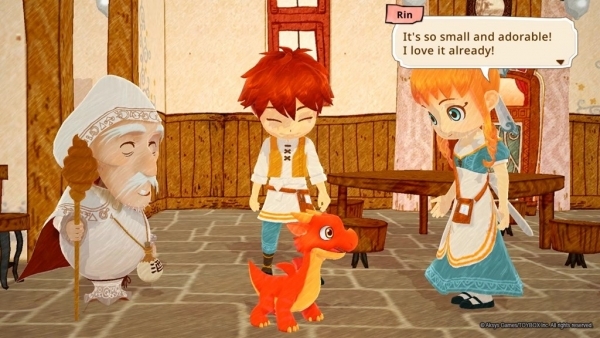 Little Dragon’s Café is a sim game where you manage a cafe and raise a dragon. 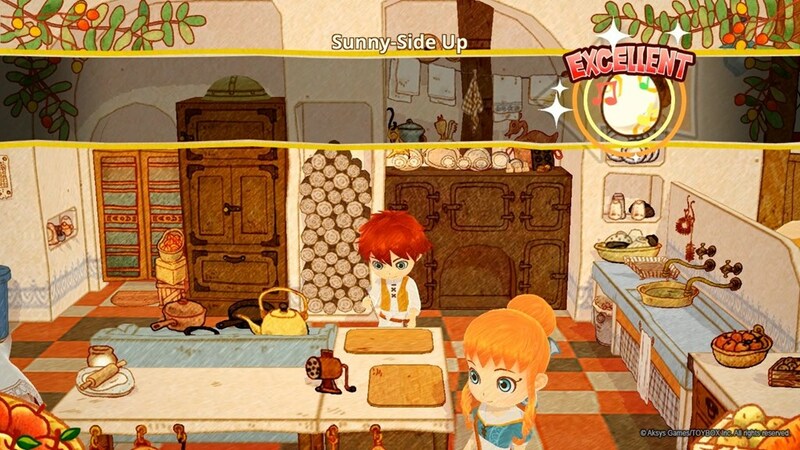 At the start of the game, two twins and their mother are managing a little cafe. Suddenly, their mother turns ill and won’t wake up from a deep sleep. A wizard conveniently manages to show up, and explains that it’s because she’s half-dragon. He then explains that if the twins raise a baby dragon into a healthy adult, they’ll be able to cure their mother, somehow. So they decide to take on the duty of running the cafe themselves, while also raising this dragon. The game follows a pretty basic structure. Much like a lot of sim games of this type, time passes in-game constantly. You wake up in the morning, you do whatever you need to do during the day, go to bed, repeat. So here, you have to go out and collect ingredients on the island you inhabit, while also managing your cafe. You also need to collect recipes that allow you to have a larger menu. So, get ingredients to make food, then make that food for your customers. As the story progresses, you’ll gain a few employees. These guys, including your sibling, will help out with cooking and serving customers. However these guys aren’t particularly hard workers and often slack off, so you might need to talk to them to get them to stop goofing around. You can also pitch in and help with taking orders and delivering meals. Running your cafe well will give you an increase in your reputation. Once your reputation is at a certain point, some story will happen. 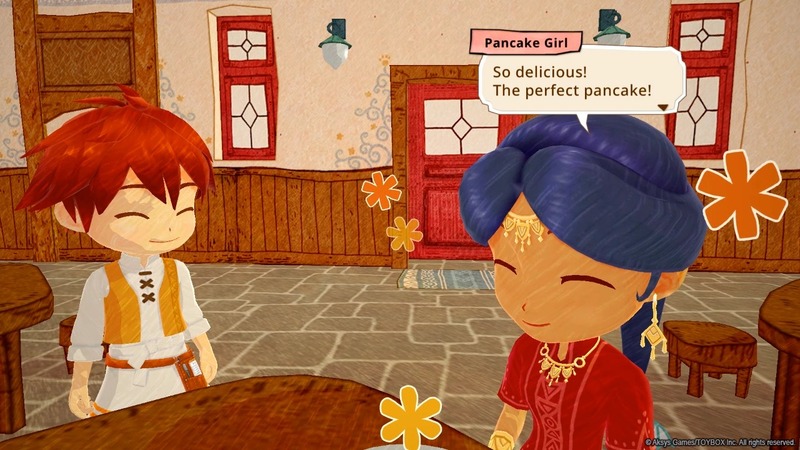 The main narrative of this game takes place with the unique characters that visit your cafe. In addition to the cafe, your wizard friend decides to add an inn for folks to stay at. So someone will show up, take an interest in your establishment, and decide to stay for awhile. You eventually learn more about them, discover some problem they’re working through, and help them out with the power of food. The end of each character’s arc involves them wanting some specific dish, so you have to go out, find the recipe, and make it for them. Then they leave with a bright new perspective on life, and some other character will eventually come. However, this game is unfortunately riddled with problems. 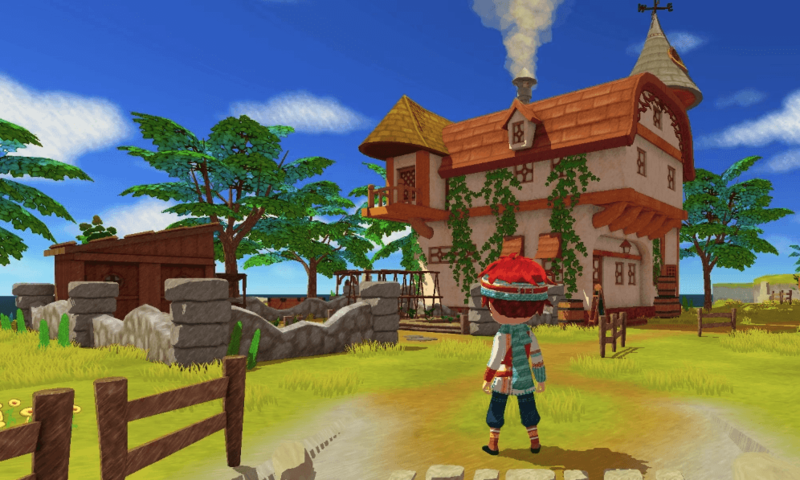 The stated goal of the game is to successfully run a cafe, but so long as you keep a generous stockpile of ingredients, the cafe essentially runs itself. You don’t earn any money from running the cafe. There are no upgrades to acquire. The only thing you get is reputation, and unless you decide to go to sleep early in the day, your reputation will pretty much always increase. At worst, it will stay the same; it will never go down. As for the menu, you have total freedom in what you can choose to offer. Cook up a meal, and you can add it to your cafe’s menu. But there’s no reason to ever offer anything other than really basic meals using more plentiful ingredients. Remember, you don’t earn money, so it’s not like you can sell more complex dishes for a higher price point. Reputation increase seems dependent on the quality of service rather than the quality of the dishes. For the cooking itself, it’s done with a pretty basic rhythm game. The better you perform at the rhythm game, the better quality the dish. Though, I honestly don’t know what kind of effect this has. It’s easy enough to get the highest quality, so I only ever served that at the cafe. Adding more ingredients to the dish does make the rhythm game a little harder. Though there’s no real reason to do this, as it doesn’t seem to impact your reputation at all. There’s no need to ever change what you serve unless you’re running out of ingredients. Changing your menu is easy enough, as you’ll always have plenty of some type of ingredient that you weren’t using. There’s no goal to achieve that won’t be achieved by itself. In a game like Harvest Moon or Stardew Valley, you’d grow food to sell for money so that you could grow more food, eventually upgrade your farm, etc. There’s nothing like that here. There’s nothing to ever strive for. You can help out around your cafe, but all you do is take peoples orders, place them, then deliver their food. You have a chef, so you don’t even cook the food. It’s completely menial. If you want a good reputation increase, you have to do it. But reputation increases just fine without that. Helping out in the cafe is also a real pain. Your employees often slack off, and you have to go talk to them to get them to go back to work. They never get better at this either. It’s not like if you yell at them enough, they’ll slack off less. The way they prioritize work can sometimes screw you over too. If a customer waits too long to get their order, they’ll leave. So your employees can be occupied with just cleaning up plates while a customer is waiting. This is why you would help out. Unfortunately, navigating around your employees is bothersome since they often get in your way. Fortunately though, you never really have to help out around the cafe. Even if you never help, you’ll still get reputation points. To make the reputation issue worse, your reputation can only get so high at any point in the story. When a character is visiting your cafe and staying in your inn, your reputation will probably only increase a couple times before it hits the max. There’s no reason to care about actually running the cafe, because you won’t get reputation points anyways. All you have to do is just make sure you’re stocked up on ingredients, and you’ll be completely fine. You don’t have to… you know, play the game. 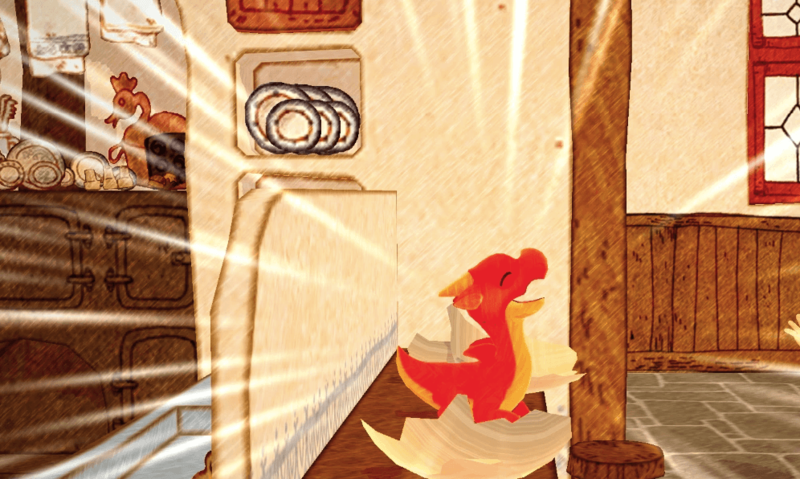 There is another aspect to Little Dragon’s Café, and that’s wandering around the island with your dragon, collecting ingredients. This is the one active thing the player has to do. At first it starts out pretty rudimentary. Just run along some paths and collect stuff from resource points. This is where all your ingredients will come from; you don’t grow your own. At first this is a pretty basic chore, but eventually the whole island becomes accessible and is then a lot harder to balance collecting ingredients and managing the cafe. Or, at least it would be if you ever had to really manage your cafe. 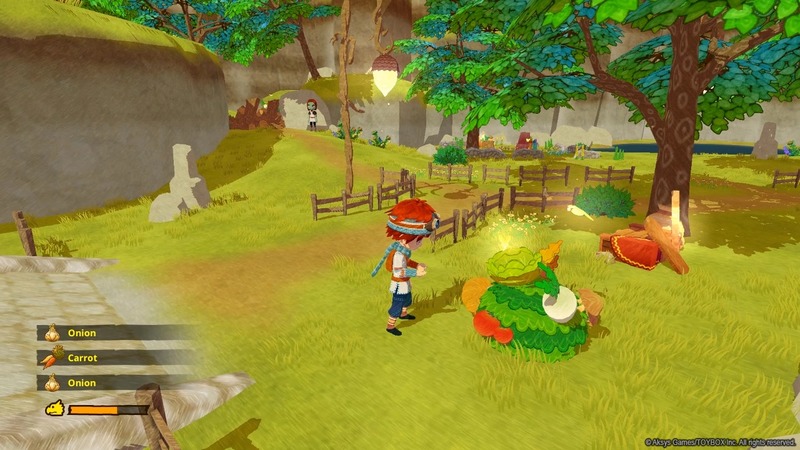 There’s nothing stopping you from spending all your time on just collecting ingredients. You can only have a maximum of 100 of each ingredient, so if you max out all the ingredients you use, you’ll be set for awhile. The further I got into the game, the less I found myself actually playing it. I would make sure I had a good stockpile of ingredients, then I’d just put the controller down and let an in-game day play out while I did something else. Once the day would finish, I’d go to bed, do some early morning chores, and repeat. The only time I really had to do something was at the end of a character arc when I had to make a specific dish for them. It’s a shame because the world in the game is certainly charming. In the beginning, I actually really enjoyed the various characters that would come to the cafe, but after awhile, it felt pretty formulaic. The last handful of characters, I could guess what the character arcs would be from moment one. And because the rest of the game was just so immensely boring, I had a hard time getting invested. Visually, the game does have a really cute art style going for it. It has this sort of hand-drawn look to it, like stuff was drawn with colored pencils. The music is fine. Every distinct area has its own appropriate track, though when you go from one area to the next, the music transition can be kinda jarring. The performance of the game is unfortunately lackluster. Frame drops are incredibly common, and when the game is transitioning from day to night, it can get really low. Considering this game certainly doesn’t look like it’s pushing the PS4’s hardware, it baffles me that it runs the way it does. There’s a lot of ways this game could’ve been improved. Having some kind of economy system where you could sell better dishes for more money would’ve been great. That would’ve actually given you a reason to use rarer ingredients. Then you could use that money to actually purchase upgrades, maybe even hire more staff. The idea of running your own store in a game is really appealing to me, and this game just doesn’t deliver. It feels like this game focused so much on being comfy and relaxing, that they just accidentally made it so that you don’t really have to do all that much. I just have a really hard time recommending this. Even if you really like sim games like this, there’s so much better options out there. Even for a child, a lot of the game is so repetitive, and the game is so long that I don’t think it would hold their attention. For older folks looking for perhaps more robust games out there, I’d give this a hard pass. That’s especially considering the game is $60, which is far too much for a game this lacking. The game is pretty long too, probably about 30-40 hours, but it has such a paltry amount of content. There’s far better out there for far less money.